Heroic Fantasy Writers: Words with M.S. 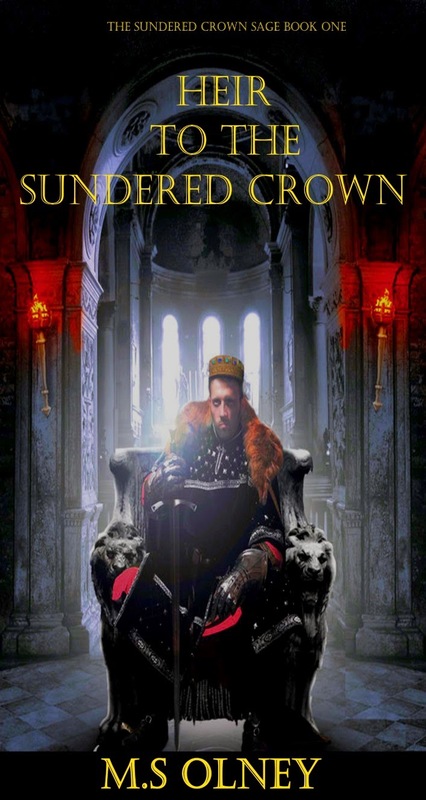 Olney, Author of "Heir to the Sundered Crown"
Words with M.S. Olney, Author of "Heir to the Sundered Crown"
Can you tell us a little bit about Heir to the Sundered Crown? The Heir to the Sundered Crown is the first part in what I hope will become an epic series. Last year it won Wattpad's Write Awards 2014 and in the first two months of release it became a top ten bestseller in the USA, UK and Australia. The Kingdom of Delfinnia is in chaos. After assassins kill the king and his family, greedy self serving men battle one another for the crown. Unknown to them is that one heir yet lives, a baby boy now hidden and protected. Sent on a quest to find the one responsible for the King's assassination Luxon teams up with Ferran of the Blackmoor the legendary Nightblade and hunter of fell beasts, Sophia Cunning the land’s greatest witch hunter and Kaiden, a noble knight sworn to defend the world from darkness. Together they find the answers they seek, but the truth is far worse than anyone could possibly imagine. I write for fun and for a living. When I am not writing stories I write content for a leading foreign exchange company. Prior to getting a job as a copywriter I got myself a degree in Journalism and am a NCTJ trained journalist. I love Tolkien, and Patrick Rothfuss. They were/are master story tellers and one day I would love to become as skilled as those two at storytelling. I also love the works of Bernard Cornwell, the guy is a master at writing battle scenes. A very talented digital artist called Phil Barnes. I stumbled across his work whilst browsing through deviantart and he was generous to allow me the use of the image that became the book's cover. He has also created the cover for my current work in progress. You can check out his stuff here. I have hit the social networks pretty hard and have generated a pretty solid following on Facebook and get some decent traffic for my blog. I also try to interact with as many readers and other writers as possible via Wattpad. When Heir won the Write Awards 2014 I definitely saw a boost in sales. My blog can be found here. I tend to post updates about my works in progress and offer insights on how I go about planning and creating my stories. I also post previews of works in progress as well as background information on world and character building. I am currently working on the sequel to Heir to the Sundered Crown and hope to have it released sometime this year. As well as that I am working on a science fiction trilogy called Terran Defenders and hope to get back to my historical fiction series Unconquered. I love to talk to other authors and readers, so feel free to get in touch with me on my blog.